I thought we were due a lesser Euphonium after last week’s spectacular showing, but in the end we got one of the best Animation Do episodes. This episode might have been my favorite series of events in the second season. They’re satisfying conclusions to a series of plot threads given cohesiveness by an undercurrent of sincerity. Rather than parroting the narrative though, I would rather focus on the execution that elevated the already excellent material this time. Two emotional peaks stood out in particular, demonstrating very different tones. 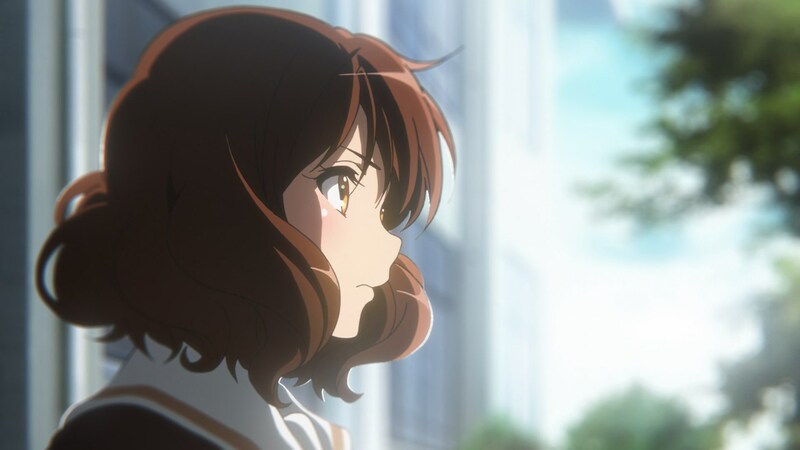 The first would be the low-key release of Kumiko’s feelings towards her sister; following a very honest confrontation where both of them revealed even their selfish grudges, Kumiko still couldn’t bring herself to admit she would miss her. The next day, idly thinking about her on the train, she breaks down into tears while finally accepting she will be lonely without her sister. The depiction of her own surprise, the delicate photography work – the reflections on her eyes are simply obscene – and the general restraint they still managed to imbue make the scene silently powerful. 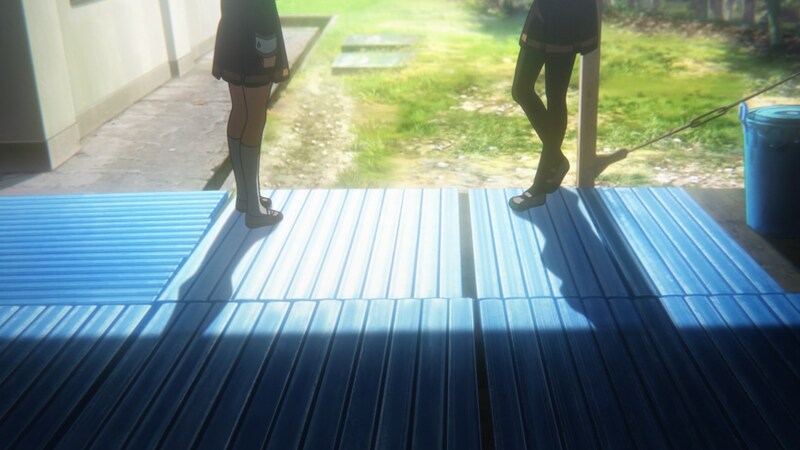 It’s not an intense reaction to a tragedy, simply a girl coming to terms with how much she truly loves her sister – with a pair of close siblings as incidental witnesses, of course. 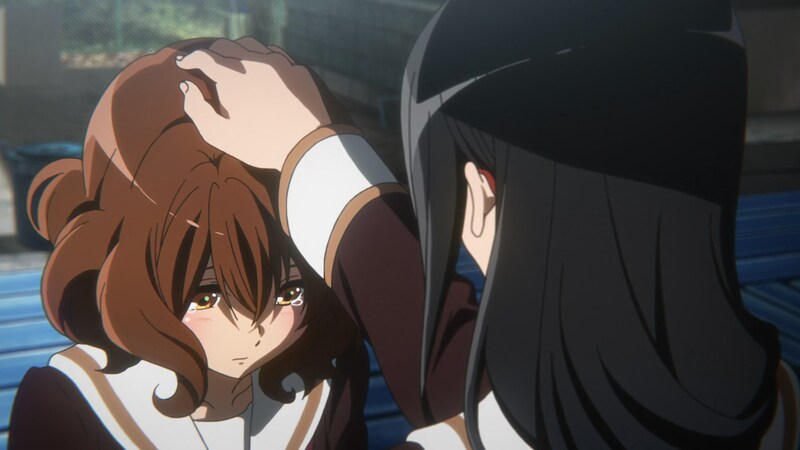 And yet, as strong as that quiet release of fraternal love was, this time I was more impressed by the moment Kumiko’s feelings were expressed the loudest. 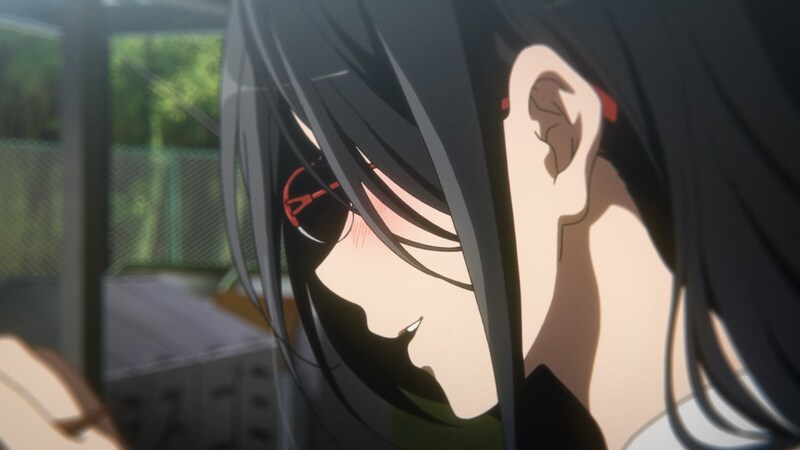 Fueled by her sister’s words to boldly pursue your dreams, she told Asuka the thing not even her close friends dared to – disregard logical approaches and the objective greater good of the band, she simply wanted to perform with her. Kumiko’s eruption, presumably at the hands of Animation Do’s top animator Tatsuya Sato, immediately became one of the most powerful scenes in the franchise. Sato’s animation is energetic in an almost violent way, which makes him a natural fit for moments like this; he’s drawn quite a few emotional outbursts after all, even within Euphonium. There’s real force behind his movement, as is apparent by seeing how Kumiko’s hair trails behind her. And the timing itself is vigorous to the point of almost being aggressive as well. These aren’t the premeditated actions of someone fully in control. 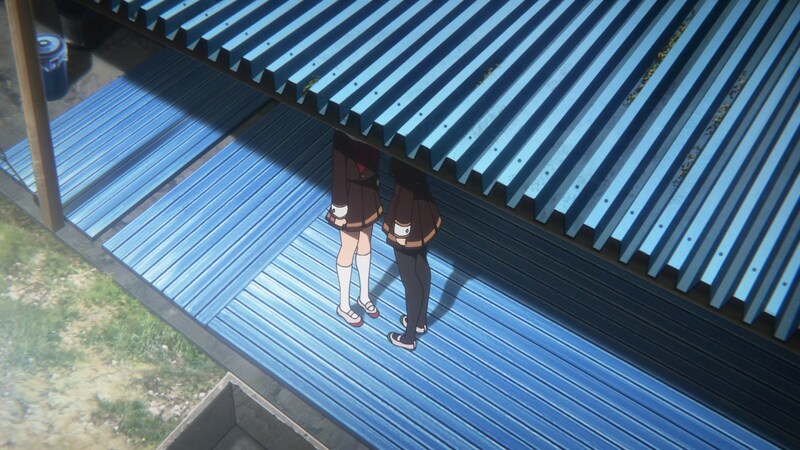 They’re not confident – at least not consistently, you can see Kumiko boldly stepping forward but quickly crumbling. His rather abrupt motion conveys feelings that are as passionate as they are unstable, perfectly capturing this sentimental frenzy. I don’t mean to imply that this is all Sato is capable of doing, of course; I’ve already talked about the necessary versatility for animators, and restrained character acting expressed through motion is something he’s done a great job with too. But leaving artistic ranges aside, animators with a strong style do have types of scenes that suit them particularly well. And when it comes to explosions of raw emotion, you can’t get much better than Tatsuya Sato. But as strong of a visual personality as Sato has, his animation isn’t the only element that catches the eye during that poignant moment. The entire scene is shot very elegantly, with a quick succession of delightful cuts. I feel like fans who have only recently realized how deliberate the framing of animation can often overreact by trying to find a precise meaning for every shot, as if a storyboard was composed of nothing but cuts with a narrative significance. The truth is far more complex than that, of course. There are clear allegories, like Kumiko getting trapped in Asuka’s barrage of attacks when she goes all out. Some choices of framing instead serve a practical use, like the series of shots that obscure Asuka’s brief crying face that neither Kumiko nor the audience is allowed to see. And this can get more subtle, when it comes down to screen presence relating to mental states. But beyond that, there’s the intrinsic value of beauty; animation composed of impressive imagery with no further meaning could perhaps be considered self-serving, but there’s no denying the value of a striking shot. Even within narrative media, a stunning scene is inherently more powerful and capable of touching you that a dry one, whether every moment of it was conceived to carry a connotation or not. In that sense, that emotional scene is almost a waste – not because the material doesn’t deserve execution this strong, as much as internet dudes angry about the lack of more Haruhi or whatever will yell, but because there are many gorgeous cuts that are barely allowed to linger. This beautiful combination of practicality and nuance with simple artistry makes that moment, and the episode in general, some of the best material Takuya Yamamura has storyboarded. Unlike some other directors at the studio, his strongest work doesn’t feel like it has a very personal style attached to it, so it’s just ridiculously competent. That might be because he only fully started directing in 2014 and hasn’t truly matured yet, but either way he did a fantastic job. If I follow that train of thought I wouldn’t only say Yamamura’s work was good, but maybe… too good? Unless that wasn’t Yamamura alone, that is. I said I still can’t clearly hear his voice, but there was someone else whose presence I could sense rather strongly throughout the episode. A certain series director who had been rather busy but is finally returning where she belongs. Naoko Yamada has expressed that she would rather turn into an invisible figure as a director, but that might be one of the few things she’s just not very good at. To a degree she’s always been a factor in Euphonium since she defined the series’ visual vocabulary during the first season where she had lots of hands-on input, but when she goes an extra mile it’s very noticeable, like episode 8 of the first season that was later confirmed to have been filled with her ideas. And after a season that understandably felt like she could do much less work for, suddenly we’re met with this episode; her favorite profile shots, the kind of intricate photography work you wouldn’t expect from Yamamura himself, and even her most blatant tell that causes fans and coworkers alike to poke fun at her. This idea lines up with the recent reveal that she will be working on the storyboard for the final two episodes, so expect the Yamada Power to greatly increase during this final arc. 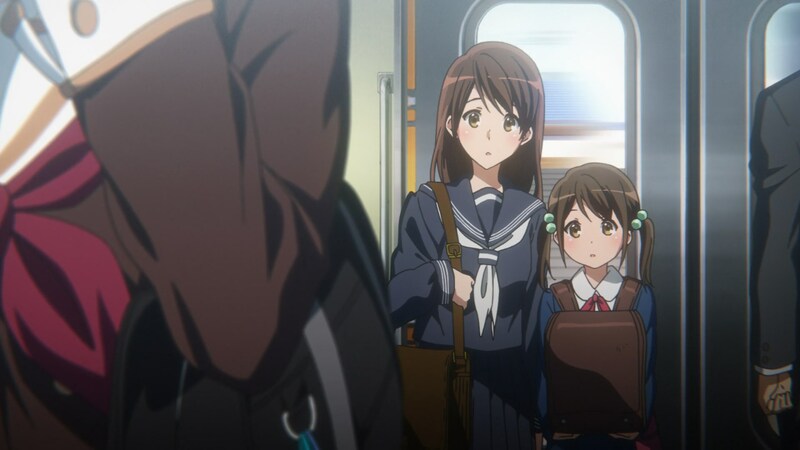 Her stealthy appearance is easily the most notable staff occurrence this week, since it was otherwise the same team as episode 3 but requiring less animators to get it finished; though for those of you who believe in fate, maybe I should point out that Yamamura has ended up directing episodes 3 and 10 on both seasons of Euphonium. Kazumi Ikeda once again supervised the animation, which meant less detailed drawings than the previous stellar episode in the hands of Akiko Takase but impeccable stability and very meticulous care. 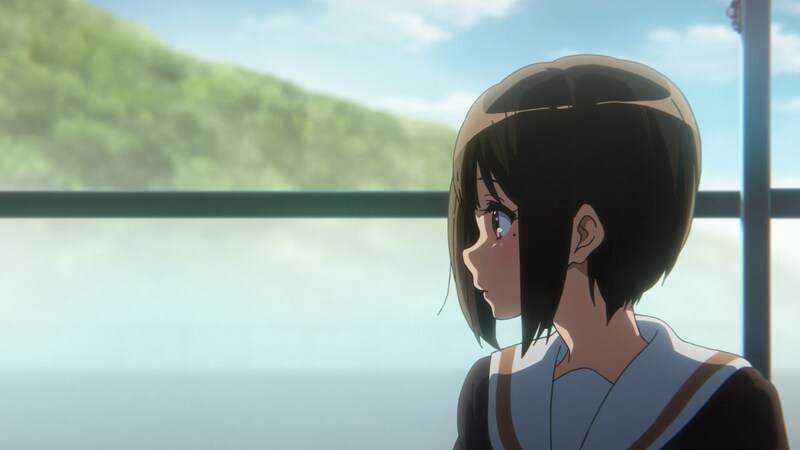 Drawings good enough to amaze animators, but the industry freaking out about Euphonium is too regular of an occurrence to count as news at this point. Next week it’ll be Haruka Fujita and Taichi Ogawa’s turn to tackle Reina’s situation, which got hinted at throughout this episode. This show’s momentum is going to be hard to stop. The animator who did the kumiko’s confession scene was amazing. I wonder why he hasn’t been promoted to AD yet. Haven’t heard him personally address the situation, but I don’t think he’s interested in it. He’s been around for a decade at this point, and he’s very highly regarded by series directors and character designers alike. I have no doubt he could pass the AD exam, so chances are he just isn’t interested in that kind of work. Maybe he’ll choose the path of episode direction instead, or maybe he’ll remain as a key animator for all his life, like some masters of the industry have. All valid choices! Takuya Yamamura has had a VERY busy 2016, consistently putting out high quality work on Phantom World and Sound Euphonium 2, AND doing great work on Koe no Katachi. He’s clearly earned Yamada’s trust. Her work on her films is so extensive that very few people have had a chance to assist her on storyboarding duties – just one act on the keion film for her mentor Ishihara, nothing on Tamako, the studio’s master Kigami on Koe… and a relative newbie like Yamamura. Not bad! Personally, I feel like you’re not giving him enough credit for the episode. You say that a lot of things aren’t him. I didn’t say that – what I pointed out is that there are many Yamada tells in the episode, which is something that’s happened with Eupho before. Supervising and making decisions when it comes to SB/enshutsu work for the whole show is ideally what her series director credit entails, but she clearly had to tone that down for the first 2/3s of Eupho 2. Glad that she’s fully back now. Well you also said his work is “too good”, which to me implies that it wasn’t really his work. I hope you’re not mad at me, but to me it looks like you’re trying to place some of the credit on Yamada, even though she was not credited with working on the episode. Don’t worry, I’m obviously not angry! Yamada *is* credited on every episode as series episode director, and I pointed out things I’m very sure she had a hand on specifically. Not like the studio is very limited by credits anyway – half the directors do animation work uncredited on their eps, and there are entire roles missing sometimes like the layout & genga ADs on Koe that weren’t mentioned in the film AT ALL until the production book. I hope you don’t think I was accusing you of not giving proper credit. I just like to think that this episode WAS all Yamamura’s doing.